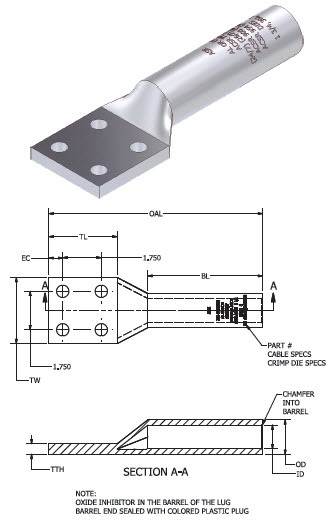 Compression Lugs for use in Substation and Switch Yard Applications. Four Hole Lugs Match up with NEMA Pad Patterns of Four Hole and Double Double Studhole Installations. Double Hole Compression Lugs allow for NEMA Pad bolting, Terminal Bock Fixturing, and Distribution Hardware. Standard Barrel Double Stud hole Lugs allow for maneuverability and optimal compression.